From the October 18, 1947, issue. Read more about Frank W. Lewis. ACROSS--l ANAGRAM; 5 DANGERS; 9 PRESSED; 10 ABANDON; 11 EBB; 13 REGAIN; 15 ACCRUE ; 16 COURAGE ; 17, SODA; 19 SEAM; 20 CHAFFINCH; 21 APSE ; 23 YORE; 26 FLICKED; 29 SOBBED; 30 ADD; 32 CALLING; 33 RISOTTO; 39 ENRAGED; 35 YULE LOG. 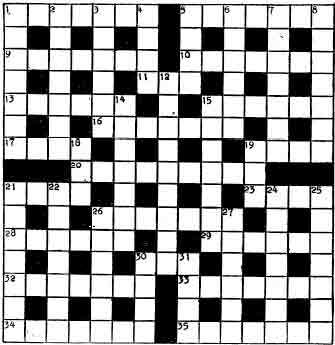 Each week Crossword Classic dips into the Nation archive for a vintage brain-twisting, British-style cryptic crossword puzzles. Puzzler-in-residence Frank W. Lewis has produced these weekly gems for more than sixty years. And Frank is still going strong. His puzzles now appear biweekly in the print edition of The Nation. These are available to subscribers only. This week’s Crossword Classic , free to all online, was Frank’s first, published in the issue for October 18, 1947 . We hope you enjoy these early crosswords, which vary slightly in format from our current offerings: solutions are written, rather than displayed on a grid. And for instant gratification, the “Click Here for Solutions” link at right reveals the answers to the current week’s Crossword Classic . The solutions can also be hidden. Sharpen your wits and your pencil, hit the “Print” button, and enjoy the puzzle!